The clinician needs to make sense of many client experiences in the course of daily practice: do these experiences reflect the simple product of complex neurochemical activity, or do they represent another dynamic involving the subjective self? When research findings from the neurosciences are applied to clinical psychology, reductionist thinking is typically followed, but this creates problems for the clinical practitioner. -psychological functioning such as focus and memory, sleep and dreaming, and emotions and pain. The idea that ‘I am not my brain’ will resonate with many clinicians, and is systematically argued for in clinical literature and neuropsychology research here for the first time. The book will be of particular interest to psychologists, psychiatrists, counsellors and clinicians who wish to incorporate advances in neuroscience research in the conceptualization of their clinical work, and are looking for a working model that allows them to do so. Introduction Part I I: The Elusive Sobjective Self. I Expressed Through the Body. I Separate from the Body Part II The Brain: Computers and Neural Processing. The Brain: Mind Maps and Meaning. The Brain: Neural Hardware and Software. Neural Cartography and I Part III Early Development: I Weaves a Mind Map. Entering Adulthood: Mind Map Transformations. I Considers Self. I Encounters Thou Part IV I Preserves Experiences: Focus and Memory. I Disengages: Unconscious States. I Feels: Complex Emotions. I Suffers: Anxiety and Pain Part V Depression: I and Neural Fatigue. Battle for the Mind: Psychosis and I. When I Loses Control: Addictions and OCD. Dissociation and Exile of I Part VI The Law, the Brain and I. Science, the Brain and I. 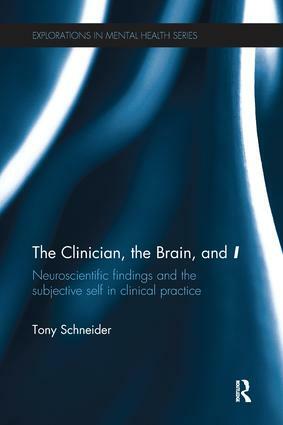 The Clinician, the Brain, and I.
Tony Schneider is a clinical psychologist and educational psychologist working in a private practice in Western Australia.